In preparation for our Bicentennial, I have a special request that is found on the About Munster Church page. There are other events in the planning stages and expected. We hope you’ll join us for an enjoyable time and any of these events. Details will appear as they become available. Here we present a selection of activities, not a complete list of all our activities. Thank you for your support of Interval House with our holding a delayed White Christmas. The items were delivered just days after the service and the staff expressed their gratitude and pleasure with what they received and how much they will help. 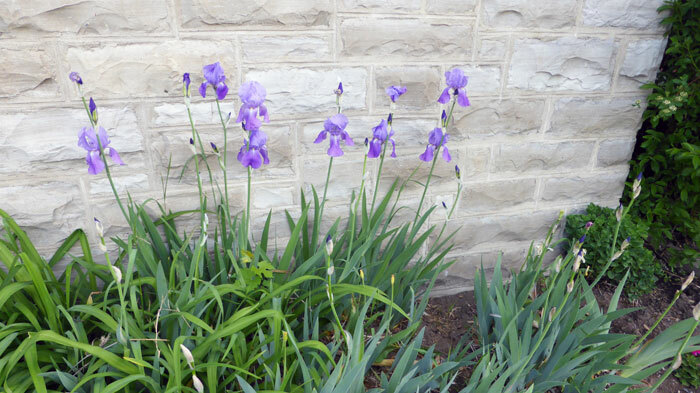 Our gardeners have been applying their talented green thumbs to make our front garden beautiful. 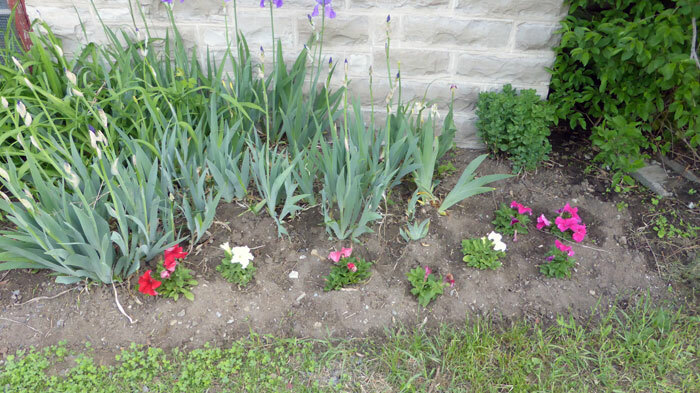 They weeded and dug in new plants and arranged them to look great. Our thanks goes to them (we know who you are!) for your hard work and care. These photos were taken early on in the process (May) and the garden alon g with our side garden look much better now. 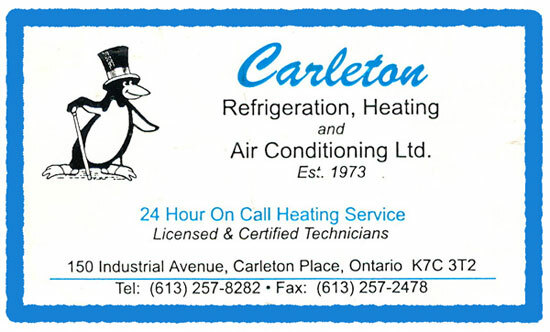 Munster United Church appreciates the care and attention that Carleton refrigeration gives to our heating system. Carleton Refrigeration continues to take care of our furnaces to keep them in proper and peak operating condition so all of us in worship and during other community and outreach activities stay comfortable. Thank you Carleton Refrigeration for taking good care of our heating system. If you would like to read scripture as part of the worship service, let Mary Tubman know and indicate your preference (early/late service, once a month, twice a month, etc.) if you have one. You do not need to be a great reader to take part, nor are you expected to read each week. Young or old, everyone is eligible and welcome to read scriptures. We have a pool of readers lined up and they read on a general rotational basis. If you are concerned you might not be good enough to read, you needn’t worry. No readers have been harmed in any reading, have not picked up any afflictions, nor have any died from exposure to reading. If that isn’t enough assurance you too would be a fine reader, all readers say they have enjoyed their times reading and feel better for it. You can help bring the scriptures to life for others. For the responsive psalms where there is a sung refrain, the choir will take the lead and you won’t have to be the lead singer. We can always use another reader – even if you want to read every two or three months. A few members of Munster United Church have moved away either to another province or another country. It was thought that you might like to stay in touch with things that happen that would not normally be shown on the web site (e.g. deaths). So a new page called “Moved Away – Your Updates” was created under Links. Periodically the page will be updated with this type of information, essentially as it happens so you can stay informed. For deaths of members, etc., most people will hear about this, sometimes later rather than in a timely manner. The page is password protected because of the type of information contained on it. If you have moved away and would like to be able to access this type of news, please send Keith Lindsey a message using this page. He will be able to forward the password to you. An adequate supply of seats is available in the left section for anyone attending our services. In the left section you will have an excellent selection of seats from the front to the back. Each pew is well stocked with hymn books and Bibles. The view of the front area is unobstructed and you will be sitting closest to the hymn numbers board. Occasionally a few others will sit in the left section of pews but a very good selection of seats will still be available. If you wish to sit in the centre or right sections, you are still welcome to do so. However, be advised that selection of seating is much more restricted – unless you arrive sufficiently early for a service when you will enjoy your unrestricted choice of seats. It has been observed that the centre and right sections fill up much more quickly than the left section. So you have a choice – centre and right sections if you want to be in amongst many other people and possibly have a slightly limited view, or enjoy ample leg and elbow room with a clear, unobstructed view of the front when sitting in the left section. The choice is yours. Update: Some people have taken note of the above words and invitation. More pews in this section are being occupied Sunday mornings. However, do not let this discourage you from sitting here, there are still good seats with a view available. If you don’t have a preference for seating, choose the section you would like when you arrive. Most times of the year are when the needs of our local Food Bank are the greatest. Many Food Bank recipients are forced to spend more of their budget for supporting their children and/or paying for utilities. We encourage you to keep your donations for the Food Bank coming because together we make a difference in our own backyard. As there are special occasions and holidays during the year, we can make an extra, special effort to donate a little extra to help make these times very meaningful for those who depend on the Food Bank. You can read about the Ottawa Police Chorus and how they helped with collection of extra items for the Food Bank. Munster Church supports the Richmond Food Bank with regular donations and we welcome your support of food and related items for needy families and the elderly. The Richmond Food Bank supports those families in the area in need, including people in Munster. Bring your contributions and place them in the basket next to the pulpit. Items are taken to the Food Bank weekly. When special needs occur, they are announced in church. We thank everyone for your year round support for this worthy cause and for making meals special for some people. Wednesday mornings 9:30 – 11:00 AM when school is in ‘session’. A time for mothers, dads, women, men, pre-school children, and those without children to gather for juice, coffee, and cookies and mingling. Join us and enjoy some Fair Trade coffee and tea. Coffee mornings take place each Wednesday morning from 9:30 to 11:00 AM. We gather for the first time in the season in September the week of Labour Day on the Tuesday, not Wednesday. The Tuesday is a nice transition for moms, dads, and preschoolers who might miss their brothers and sisters at school. When it comes close to Christmas time we stop gathering until after New Years. We also stop meeting after the kids finish at the end of the school year. Wednesday morning Coffee Breaks time (9:30 to 11:00 am) are very popular. 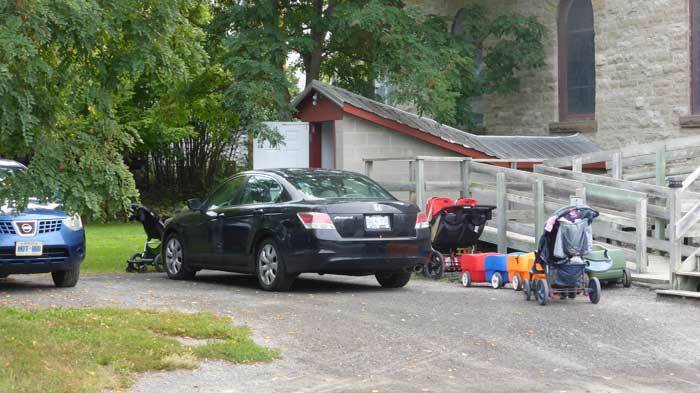 Vehicles are parked in an orderly manner to maximize parking space. Thursday evening 7:30 – 9:00 PM. We rehearse from September to mid-May to prepare the hymns and a Sunday anthem. If you have an interest in singing with us, or just wish to sit in and hear some of our music or for a period of meditation with musical accompaniment, join us Thursday evenings. Two books were published this (2012) fall. The first is “Historic Churches of the Ottawa Valley” by Alan Bentley. These are available at Munster United Church. The price is $25, with $10 of that going to Munster Church. The other publication is “The Early Ministers” talks about the early ministers around the time of the start of the Munster congregation serving the early community and the church in Munster. Following the success of the outreach program at Ashton United Church, Munster Church Council thinks the idea and results are very worthwhile. The Munster Church program is actually a series of smaller outreach projects. To start, our first project is receiving old and unused pairs of glasses. We will forward glasses received to Laurier Optical which will then send to the people of Haiti. They also send an eye specialist, to give the gift of an eye exam and prescription lenses in your old frames to people who would not otherwise be able to afford these. Bring in your no longer needed glasses and place them in the box labelled “Glasses for Haiti” and we’ll look after the rest. During the year the Youth Group of the Pastoral Charge decide and take on special projects for outreach. In the past the Youth Group have supported The Mission through fund raising to provide extra meals to those in need, the Snowsuit Fund to help clothe younger people to keep them warm during winter, and other equally valuable and appreciated causes. In 2017-2018, the Youth Group is raising funds to support Big Sky Ranch. Read about their January 2018 Bottle Drive. Munster Church undertakes several fund raising activities and events each year to augment income from offerings and to allow us to undertake programs beyond the basics. Some run on an ongoing basis and are operated by a small group of dedicated people. For example, we have been selling Loblaws Gift Cards for years and the program provides a good return to the Local Fund of Munster Church to support regular programs and special undertakings. Other activities, such as suppers, take place a few times each year and require volunteers. Simply stated, your church buys gift cards at a discount and sells them to supporters (you) who use the gift cards the same as you spend money. The church earns the difference. The cards are equivalent to cash at Loblaws in Ontario and Quebec), Real Canadian Superstore, Your Independent Grocer, and valu-mart stores. In addition, they can be used at Zehrs, No Frills, Fortinos, Extra Foods, Loblaws Superstore, Provigo, Maxi, Maxi & Co, Atlantic Superstore, and the Real Canadian Wholesale Clubs locally and across the country. For information contact Pat or Keith Lindsey. You can purchase cards from Pat or Keith Lindsey. March of 2007 saw the congregation vote to undertake support of Fair Trade Organic coffee. Since then, we have been selling these products and have been using them ourselves for church activities. The program benefits more than one million farmers and farm workers in 58 developing countries and these numbers are increasing. We have your preferred type and flavour of coffee. Check our prices against other Fair Trade suppliers and we know you will be impressed. We offer a variety of coffee types. You can choose from ground coffee or beans and regular, decaffeinated, or flavoured. For current pricing, contact Pat Lindsey. You can place an order with Pat Lindsey at church, at Wednesday Coffee mornings, by email, or by telephone. We try our best to have stock on hand. You can send Pat an email with your order or requesting information. If you wish to send an email message directly to Pat, send it to muccoffee at gmail dot com. You will need to provide the appropriate character substitutions in the gmail string to send your message successfully. Your order will be received by Pat Lindsey and she will reply with the status of your request. Alternately, you can send a message through this site using the Contact Us > Contact Munster UC page. Fair Trade messages will be forwarded to Pat. We look forward to having you join the Fair Trade Organic supporters and to serving your taste and needs. Every fall, the church choir sells frozen blueberries, raspberries, and cranberries. Orders are typically due in early October; however, timing can change a little. When the drive is in progress, details can be found in the Events section above. If you would like to be notified by email about the sale, please pass your name and email address to Pat Lindsey. Your email address will only be used for this program and will not be shared with anyone else. Be among the first to know about the berries by signing up. You can always have your address removed from our list by requesting it. Whether you are a collector of works of local artist Ben Babelowsky, enjoy colour prints of local architecture, a collector of church prints, looking for a special Christmas, wedding, birthday, or baptism gift, or you want something to enjoy looking at on your wall, you will want one of our Munster church prints. They are a limited edition, numbered colour print by local artist Ben Babelowsky and measure approximately 18 inches by 13 inches. They are an attractive addition to any wall and capture a winter moment. In the front right is the old school house, later the Orange Lodge in Munster, then the tea house, then pub, and now “at the School House”. The price is $30 each. You choose the framing to suit your location and placement or the intended recipient. Contact Pat or Keith Lindsey or any member of the Munster Council. There are still prints available. Several times during the year, Munster Church holds a supper. We typically hold one in the fall around the time of our church anniversary. Date, time, and food information will appear in the Events section above and in the event summary section at the top right once the times are known. We have served a variety of suppers in the past including beef, ham, beans, spagetti, and lasagna. The choice of food type is left to the convenors and is always delicious and appreciated by our supporters.